If you've ever spent a frustrating amount of time trying to scrub baked-on food from the outer surface of a skillet, had a pan which looked new on the inside, but brown from use on the outside, you will wonder why this isn't a feature of every pan. The heavy gauge hard anodized skillet heats quickly and provides a non-stick cooking surface all in one pan. The Circulon has sloped sides to make sliding food out or flipping foods easy. The edges are also flared for ease of pouring. Height of the sides/depth of the pan helps keep splatter in the pan and allows you to cook a greater volume of food. Warm several dishes in a single pan with that kind of room, cook a one pot meal and spare yourself the cleanup of extra pans. The handle isn't just stainless steel, Circulon has thoughtfully added a silicone Comfort Grip to prevent slipping, and yet the handle is still oven safe up to 400 degrees. Comes with a tempered glass lid that allows you to watch the progress of your cooking without lifting the lid and helps keep in flavor, moisture, and nutrients. The Elite twelve inch has a lifetime limited warranty. 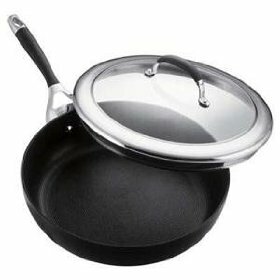 If you find the helper handle feature of a lot of newer model pans annoying, this skillet has outstanding features without it. A few users have described an unusual issue with the empty pan tipping due to the weight of the handle, but still tend to love the skillet for its overall performance.A nice, affordable wedding gift as it combines the quality of a gourmet piece of cookware with a practically foolproof non-stick surface that cleans up in a flash.